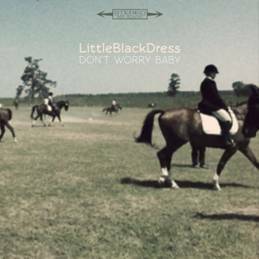 With their seven-inch single Don’t Worry Baby, Texas-based rock duo Little Black Dress have undertaken a task that causes many bands to simply crumble by including a cover of the seminal Beach Boys track, “Don’t Worry Baby.” Instead of making a straight note-for-note remake of the original, Little Black Dress replace the surf rock elements with a lo-fi shoegaze sound crossed up with the mellow pop-rock sound of bands like Doves and The Charlatans UK. It’s an interesting treatment of a rock classic, but an excellent one that adds new depth to it. The b-side, “Underoverpass,” is a hypnotic track with a classic indie-pop. Although it lacks the dynamic feel of “Don’t Worry Baby,” it is a solid track. The download-only version of the single includes two other new tracks, “To Do With You” and “Stations,” which are both solid pieces of pop-rock with a slightly more up-tempo feel. This is a solid EP and one that is worth the listen, if only for the cover alone.